Does anyone know a supplier for 20mm wide and 15mm gummed tape in the EU. I'm aware of pyropowders.de but the prices are high. I can buy a roll of 25mm wide gummed tape here in the UK for £1 a roll but can't get anything below this width and that's the size I need for 3inch and 4inch shells with a WASP. Anyone able to help? Paper tape in the UK! Get what you can, maybe it will be necessary to split it to size. Don't buy too much! Most users have had some damp off and go solid if the weather gets damp. It is made as parcel tape, the paper tape is coming back into use as it's natural and has no plastic but 20mm tape isn't needed for parcels. I'd be looking to buy 48 or 50mm tape and re-spool it manually, passing it across a blade or two to get the right width. Whatever you do take each roll and put in in a separate snap top bag with a dessicant pack. Rsambo. Pyropractic has some, maybe cheaper than pp...? Thanks everyone, sounds like a combo of Arthur's and Col's ideas could work. Col I see what you are saying, perhaps a leap I need to make, the benefits of which could really pay off. The slitting machine doesn't sound too tricky to put together, the gluing machine I'm not so sure. Col - not wanting to ask you to spoon feed me but have you any pointers? I've seen that type of coating apparatus called a "kiss coater" if you want to research further. Glue is fed to the roller pan from a reservoir at a uniform rate with a peristaltic pump and the level is held constant by a drainage aperture that is higher than the bottom of the pan. The paper needs to wrap around a decent percentage of the disc or it will just slide without driving it. Dont be tempted to use a small diameter disc for the same reason, the larger it is the more paper you`ll have in contact to drive it. I could see making a slitter for gummed tape that was manually driven, (say 48mm tape into three 12mm tapes about 250m per reel) the weight would be small. I rarely see nice kraft plain paper on a roll, and they the rolls are 500mm wide -so heavy! Slitting these would possibly be a powered machine task. Yes with England's regular damp weather I do see the point of having paper tape and gumming it during final use. In the US, we have ULINE, they have all sorts of kraft paper in 12" rolls, its very easy to make a slitter from an old board and utility blades, I have done it many times. Using virgin kraft, I just run the roll through the bandsaw and slit the paper to the widths I want and two trim ends of 1/2" or so. The #40 is very strong! You can buy pure kraft rolls from almost any packaging supplier, most towns and cities seem to have one. A 4ft roll takes a bit to get it up onto your shoulder Slitting a roll of 48mm gummed tape into 12mm rolls manually would be tricky as you have dont much room for error. Motor driven is better as you need to maintain even tension on the tape all the way from the main roll to the slitted rolls. If it goes slack it will wander, tear and/or get mangled. Stanley knife blades dont take long to lose their edge, Carbide slitting blades are best but they`re not cheap. Make sure you have a way of adjusting the blade so you can make use of all the cutting edge, not just a small part..
Edited by Col, 13 February 2019 - 01:24 AM. In the UK we have circular blades, like a pizza cutter that can be left to turn and keep exposing a fresh edge. Craft shop roller knives. 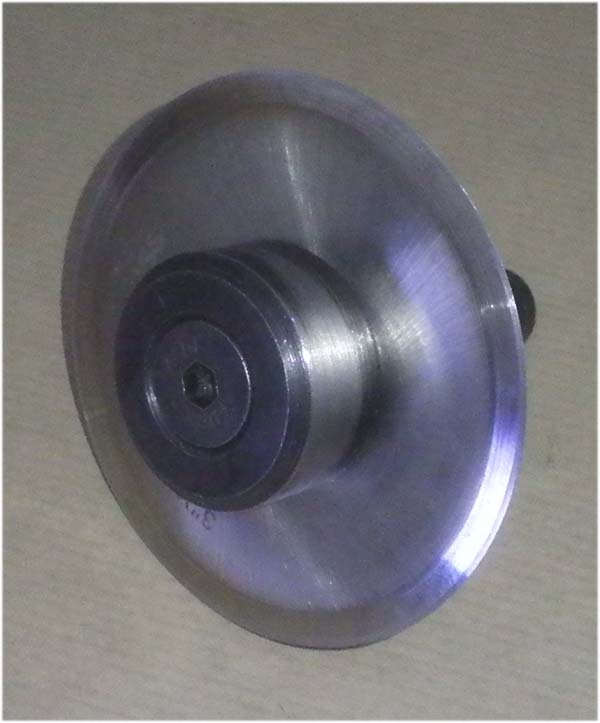 Heavy duty circular blades can be made fairly easily from 3" slitting saws, they`re great for cutting tubes but not much cop for slitting paper. Edited by Col, 13 February 2019 - 03:12 AM.